Olympic investigation: Who do Adidas sponsor? 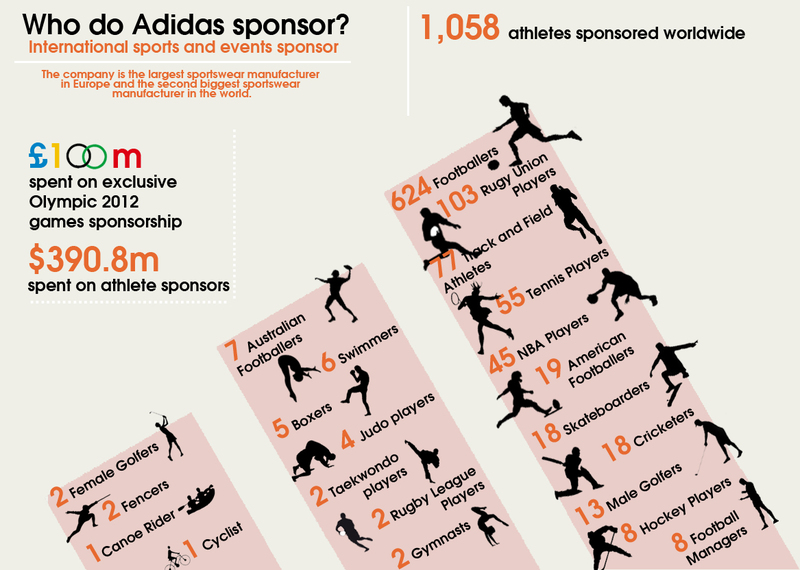 Adidas is a major international sports sponsor, with its sponsorship budgets on the rise, it's important to look at how many athletes Adidas currently sponsor. The infograph shows that Adidas currently sponsor a wide range of athletes from across the globe, however these results show that their sponsorship of athletes heavily fall within that of rugby and football. Lovely vis in terms of colour and typography although it needs to be much clearer what 'story' it's communicating (why are the big numbers at the end? Can you do more with those numbers? What does the height of the boxes mean?). The text also needs work: typos like "Adias" and "heavily relies in both rugby football."